In 1988, seventeen-year-old Sue Bowl has a diary, big dreams and £4.73. What she wants most of all is to make it as a writer, as well as stop her decadent aunt Coral spending money she doesn’t have. Living in their crumbling ancestral home should provide plenty of inspiration, but between falling in love, hunting for missing heirlooms and internship applications, things keep getting in the way. Thank you to Transworld Publishers and Naomi for sending me the copy of Martini Henry to read and review. 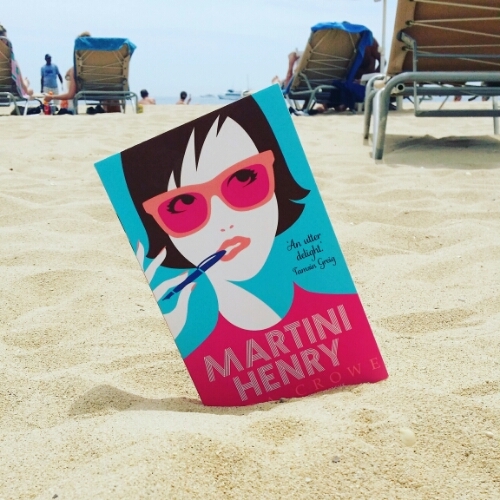 Delivered to you in diary entries, Martini Henry is all about the life of teenager, Sue Bowl. Sue is embarking on a career of Creative Writing and is desperately seeking employment to aid her writing career. However, when faced with as little as £10 in her bank account, she has no choice but to work as a waitress in a restaurant. Sometimes when you describe a teenage character, people automatically presume you’re talking about an adolescent whiner, with up and down emotions, who acts like Kevin the Teenager from Kevin and Perry. Well, not this time, Sue is incredibly mature for her age and comes across as if she is very experienced in just only eighteen years. Her writing style is very traditional and she seems to find an interest in Russia literature – as her self-penned novel shows. She is also incredibly influenced in her writing and doesn’t always trust herself that she is good enough, when she is! At the beginning, you learn that Sue is attending a writing course in Greece (I think it’s Greece!) developing her skills and making friends with the other attendees – they help her an awful lot with her work and encourage her to continue even when she’s back at home. You do have the opportunity to read some of her work, which holds the Russia influences, as explained previous. She too adds Pensees into her diary, which essentially are words she’s learnt during life and wants to use them to increase her vocabulary. I found there were two main elements to the story: Sue’s writing career and the history of her Aunt’s house, Green Place. Her Aunt’s house holds ‘hidden treasure’, or so her Aunt’s friends believe, and they go in search of the unearthed jewellery. A book called ‘For the concern of the rich and poor’ may have all the answers, which leads onto Sue posting some entries into her diary from the book.I most enjoyed learning about the house and especially London Taylor, an orphan that ends up residing in Green Place after escaping the clutches of the orphanage. I will admit that I did find the novel a little slow in the beginning because I didn’t know what direction it was going to take. However, Martini Henry was insightful, warming and definitely not your typical teenage diary. Again, as a few other Goodread reviews have said, there’s an Adrian Mole air to the story, and when you think about it, I wouldn’t say they’re that wrong. The diary is an insight into a teenager girls life and possibly a different route to that of a typical teenager living in 1988. I can’t say I know much about the time because in 1988, I was 1 – I’m 29 this year – but I don’t think the novel was that time specific really, there wasn’t any references to the era, so it essentially could be placed at any time!